Kormis’ most important work remained distinctly personal in origin. He first exhibited a maquette for a Memorial for a war cemetery at a solo exhibition at the Berkeley Galleries, West London, in May 1946, believing that ‘the post-war world need[ed] artistically significant monuments which serve[d] no immediate utilitarian purpose’. For the rest of his working life he wrestled with the problem of how to deliver a war memorial which combined both ‘bereavement and hope’, eventually resulting in his Monument to Prisoners of War erected in Gladstone Park, Dollis Hill, in 1970. His works on these themes also includes 'Marchers' (1974), outside King’s College London, and a supporting, emblematic series of prophets. 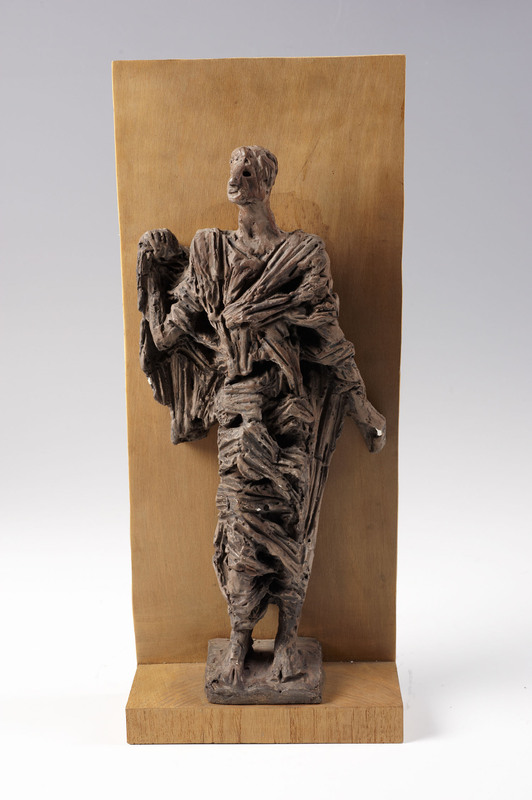 An earlier study for a memorial, exhibited in 1946, included an adolescent boy called 'The Young Prophet'. This piece may be a maquette for a later iteration of this subject.